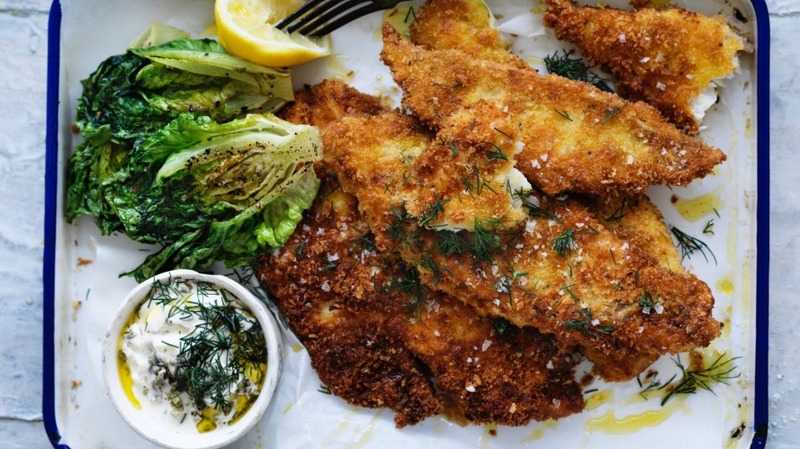 Part fish and chips and part schnitzel, this simple fried dish is a great way to cook fish at home. The double dredging in flour and egg creates a thicker coating that helps to protect the fillets and keep them moist. 1. To make the tartare sauce, combine the mayonnaise, cornichons, capers, dill and lemon juice in a bowl and season with salt and pepper. Set aside. Heat the oven to 100°C. 2. Put the flour, eggs and breadcrumbs into three separate trays or bowls, each large enough to fit the fish fillets. Season the flour with salt and pepper. Dip a fish fillet into the egg, then coat in the flour, then egg, then back again into flour, then egg and finally in breadcrumbs until well coated. Set aside. 3. Heat a large, deep frying pan over medium-high heat. Season the cut side of the lettuce with salt and pepper and drizzle with oil. Cook the lettuce, cut side down, for 1-2 minutes, until charred. Remove and set aside. 4. In the frying pan, pour oil to a depth of 1cm and heat over medium heat. In two batches, cook the schnitzels for 2-3 minutes on each side, until golden and just cooked. Remove and drain well on paper towel. Season with salt and pepper. Keep warm in the oven while you cook the remaining schnitzels. Serve the fish with the grilled lettuce, tartare sauce and lemon wedges. Adam's tip: When deep- or shallowfrying at home, the most important rule is to not overcrowd the oil. Doing so will cause the oil temperature to drop and affect cooking times.